Hermit crabs account for one-fourth of crustacean species and typically hang out at rocky or sandy areas in temperate or tropical oceans from the deep sea to intertidal zones. These shelled creatures feed on plankton and detritus, or small organic particles. 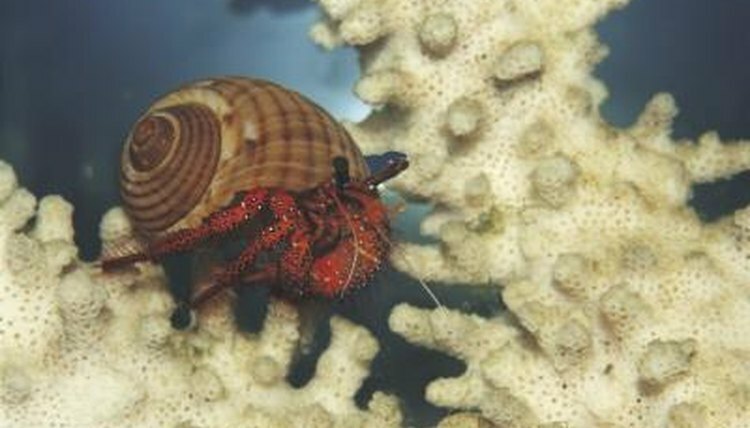 Depending on the species, most hermit crabs range from 2 to 6 inches in size; however, some giant hermit crabs have reportedly reached a length of 8 inches. A hermit crab’s distinctive characteristic is his shell, which protects his soft abdomen that curls into the spiral shape of the shell. A hermit crab’s shell is held in place by little grippers called uropods. Tiny scales cover the uropods and legs to provide traction. In addition, his longitudinal abdominal muscles contract to press against the inner walls of the shell for further stabilization. When a crab grows too large for his shell, he begins the search for another. A hermit crab will never kill to obtain a new shell. He simply looks for a vacant home. When the crab finds a possible candidate, he will inspect the size, shape, weight and mobility of the new shell and even try it on. If the new shell doesn’t meet the crab’s expectations, he will remain in his old shell until he finds a suitable replacement. It is important for beachcombers, tide poolers, divers and other explorers not to collect shells near the homes of hermit crabs. Since hermit crabs rely on these empty shells for new homes, removing empty shells may be detrimental to a crab’s health and survival. Since hermit crabs are nocturnal, they are most active after sunset; if you have a hermit crab as a pet, that's the time to observe him drinking, eating, cleaning or interacting with other crabs. A dark, cloudy or rainy day could also coax him out of his shell. Wild hermit crabs are most active from 8 p.m. to midnight, and their activity is very limited once daylight rolls around. Crabs enjoy climbing, so if you have a pet hermit, you should consider providing him with items he can explore. But be careful -- hermit crabs have been known to crawl out of their cages that aren't properly enclosed. When most people think of the word “pet,” they lean toward the fuzzier canine or feline variety, but hermit crabs also make great companions. Just like dogs and cats, hermit crabs can be curious and playful. Owners have observed smaller crabs grasping the silicone sealant of their aquariums to climb, claw over claw, up the corners of their homes. Also, hermit crabs make great pets for anyone with allergies. Since hermit crabs are crustaceans, they do not carry any dander or potentially harmful bacteria or allergens. Dorothy Stephenson is a writer with experience in travel, health, nutrition, equine science, real estate, history, green living, fitness and agriculture. She has written for publications such as "EQUUS," "American Farrier’s Journal," "Today’s Diet and Nutrition," "Military Officer" and "The Washington Examiner." How Does a Hermit Crab Move? Do Crabs Have Simple or Complex Eyes?